Recently I came across the darling dazzling jewelry. They create very beautiful interchangeable jewelry. Particularly the interchangeable necklace that’s completely versatile & customize able intended to be worn as a sentimental or statement piece. And now they want to expand there business but they need help of fashion and style loving community to achieve their goal. Currently they are running a compaign on kickstarter to collect funds of expansion. 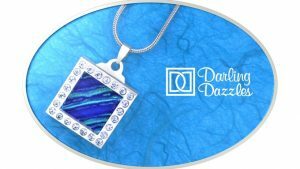 As once this project is funded the next Dazzle they want to create, is one that will allow the customer to send them an image of anything that they would like to see on their charm. These could include, but are not limited to: pictures of their children, grandchildren, pets, scenery, vacation memories, child’s artwork, loved one’s signature, in memory of someone and so much more. The possibilities to create an extra special Dazzle, are endless. By running this campaign, they would like to raise the money to execute this plan and get the custom Dazzles underway. The pledge would go directly to equipment and materials to make this come to fruition.